Throw in a couple of hot peppers at the beginning of cooking for extra spiciness! When that first little nip of fall is in the air, I start thinking about warm, hearty, comfort food. I especially love dishes that can be thrown in the slow cooker. What can be better than coming home on a chilly night to savory aromas from the slow cooker? This week, when temperatures dipped for the first time of the season into the 40's, I decided to pull out the slow cooker and start a pot of turnip green soup. My grandmother always said the turnip greens were sweeter after the first frost, so technically I was a bit early, but since I was not using fresh turnip greens I ignored this bit of grandmotherly advice. First, 1 (16 oz.) pkg. frozen turnip greens. I have made this with a large (27 oz.) can of turnip greens, but unless you can find salt-free turnip greens in a can, I think it is better to use the frozen ones. This soup has plenty of salt from ham, sausage, and soup mix, so it really doesn't need any more. Next, a bone in ham hock or a ham steak. If you can't find a piece of ham with a bone, don't worry. The bone just adds a little more flavor, but this soup is plenty flavorful without it, so don't fret if you end up with boneless piece of ham. Do not use country ham. It is way too salty. And do not, for the love of everything southern, use canned ham! I cannot even bear to think about that! At the end of cooking, take your spoon and break the ham up. It will be easy to do after it has cooked for several hours. The third ingredient is a one pound pkg. of Conecuh sausage, sliced. I used the original smoked sausage, but I feel sure the hickory smoked or hot and spicy would work well, too. Conecuh is a true Alabama brand of sausage and while it is easy to find in any store in the south, I realize folks in other parts of the country might have a hard time finding that brand. If you can't find Conecuh where you live, substitute any good brand of smoked sausage. Or go online and order some from Conecuh Sausage. 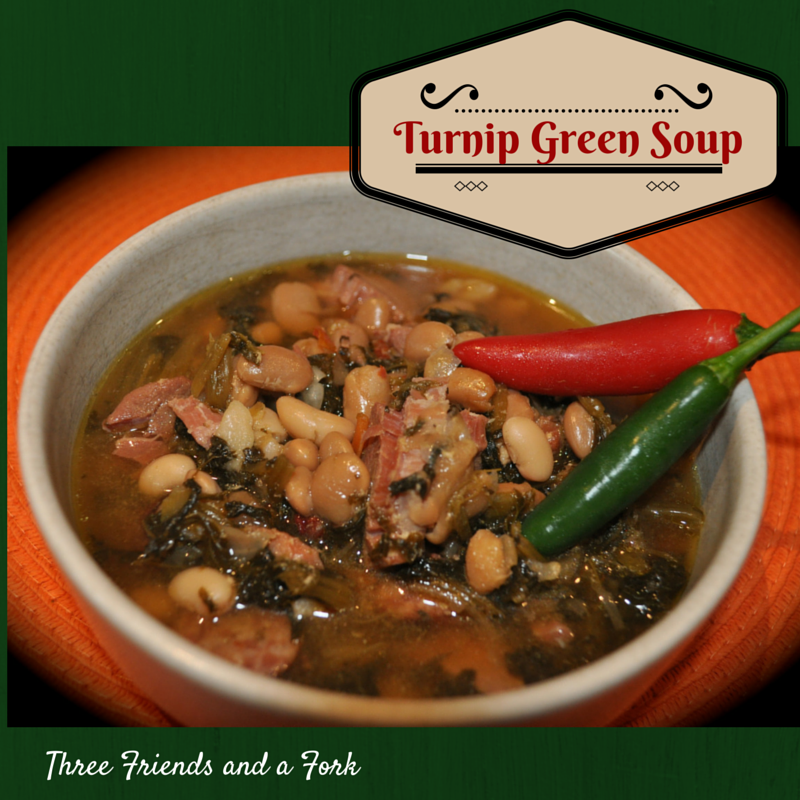 Great Northern Beans are the next essential ingredient in this recipe. I vary between 2 and 4 (16 oz.) cans. Usually I start with two cans. Sometimes those two cans will cook to bits in the slow cooker and I will add another can or two shortly before serving. I also vary this depending on the people for whom I am cooking. My husband and I like more beans, my boys like fewer. The last two ingredients are one pack of Knorr Vegetable Soup Mix and one (32 oz.) box of sodium-free chicken stock. You can use homemade chicken stock as long as it doesn't have too much salt. That's it! Dump everything in the slow cooker and turn it on low for 6-8 hours depending on your slow cooker. If you like things spicier, you can toss a couple of hot peppers into the pot with the other ingredients. I like to serve my turnip green soup with corn bread sticks and sweet tea. It is so good! Try it and let me know if you agree! If you have Our Table, the Reynolds' Family Cookbook, this recipe can be found on page 24.